This New Year's Eve the Gunflint Trail is blanketed with seventeen inches of snow including a couple of inches of new powder. All the ski trails are open and busy. So you skiers enjoy it! Most of the Gunflint Trail Winter Lodges are filled. Here at Poplar Creek Guesthouse B&B. everything room, cabin and yurt is booked including fourteen skiers from Minnehaha academy's ski team and their coach who will be spenting New Years eve at the Croft Yurt Camp. Biggest group this Yurt Camp has ever held. As the New Year approaches this evening, the restaurants are gearing up for a big night. At Old Northwoods Lodge, Gunflint Trail chef par excellence is preparing the dinner. According to Gale they have reservations for seventy but they still have some openings. At Gunflint Lodge, according to Lee Kerfoot, "We are planning a five course gourmet dinner; then we have a bonfire from 10:00 PM to 1:00 AM. And from 11:00 PM to midnight we will be having appetizers and a champagne toast." At Hungry Jack Lodge, for New Year's, Forrest is cooking- up a steak and champagne dinner. Windigo Lodge is planning a traditional prime rib dinner special and then of course for late night New Years celebrations Windigo is the place to be! Also just got word from Sarah at Trail Center that they will be featuring an all-you-can-eat crab dinner from 5-10:00 PM. Then, according to Sarah, "it is off to bed for everyone over 40." Hah! No one on the Trail believe this. Reservations are required at all these restaurants except Trail Center. The Krauses of Poplar Lake are planning to ski first, then meet a group of friends and going to dinner at The Landing on Devil Track.. They plan on being home early, watch a little TV and go to bed. According to Jo Ann, "we need plenty of rest for skiing. The conditions for skiing are perfect here at Mid-Trail!" However I believe most Gunflinters are celebrating with quiet get-togethers with friends and relatives. On Hungry Jack Lake, John and Barb Bottger are doing just this- their oldest son and his family are up and they plan to not only take in New Year's but also celebrate their son's birthday. At the end of the trail the Proms, of Voyageur Outfitters are planning a quiet get together with friends and relatives. Their festivities include a game of poker- Texas Hold Em and some other games. Sue Prom states that, "I imagine we'll try and eat all of the treats tonight so we can start the traditional new year's resolution of losing weight!" A special New Years treat can be found at the Pattens where they offer sleigh rides. According to Mark Patten, "We'll be doing 5 sleigh rides this night. On the first ride it will be a couple that will be getting engaged at the 'kissing tree'. Our last ride will be 14 people of which 7 will be from Robbinsdale High School class of '69......'kids' that I haven't seen for 36 years! Should be great fun! The last two rides of the evening are large enough that we'll have to use two teams of horses at once, should be very interesting." Joining the Pattens on one of their rides will be Barbara Young and Rochelle Staley from Poplar Creek Guesthouse B&B along with some old friends and long time Hungry Jack Lodge guest Steve and Jan McCrady and their family. As for Barbara and I it is off to dinner with Rochelle and neighbor Dave Smith, a short stop at Windigo and then after sending the sleigh riders off and running it is off to an early bed as usual for this one. So here is wishing you a great big Happy New Years! And life goes on along the Trail. 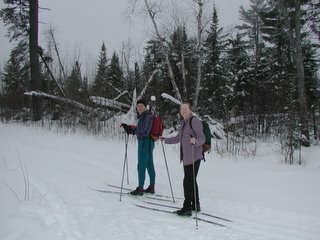 Late morning on Christmas Eve with the tempetature hovering around thirty, Ken & Andrea Chartier from, Stevens Point, Wisconsin stepped into their skis at the Banadad's western trailhead. Their first nights destination was the Croft Yurt followed by the Tall Pine Yurt the second night. Two days, thirty kilometer, two nights at two yurts and sauna at the finish of their ski the pair became the first to complete the entire Banadad Trail this ski season. Upon completing the trip they said trail was good and the skiing great. Boundary Country Trekking's Yurt to Yurt Skiing programs appeared in the New York Times' Travel Section on Christmas Day. The yurt program was written up with four other hut skiing adventure including the Ten Mountain and Catamount Trail hut adventures. NEW SNOW PAST 7 DAYS: 2"
SNOW DEPTH IN WOODS: 16-18"
NEW SNOW PAST 7 DAYS: 12"
December 16- The clearing and packing of the Banadad Ski Trail was completed and the trail opened for skiing. Tracks were no sooner set before the first skiers arrived. 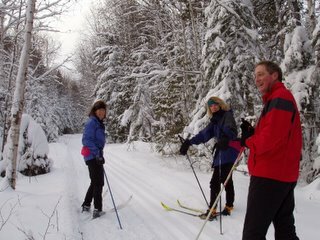 The trio skied from the Tim Knopp Trail on to the Old Logging Camp on the freshly laid tracks. Current conditions are twenty inches of snow on the ground. Eight to ten inches of snow base on the Trail. Trail tracked from eastern trailhead to the Old Logging Camp. Lace Lake Trail packed and will be tracked on Monday, December 19. Ski trails just do not appear tracked and ready for you to step into your skis and head out. Many hours of labor are required before the first tracks can even be set. In the case of the BWCA's Banadad Ski trail this is even truer! Twenty-six kilometers of the Banadad lies within the BWCA Wilderness. Within the BWCA all maintenance must be done with hand tools. And this takes time- lots of it! This year Boundary Country Trekking (BCT), which maintains and tracks the Banadad logged 604 person hours of labor, just to get the trail open for skiing. Within the wilderness portions of the trail all the work was done by hand and usually required crews to walk and in two-instance canoe many miles just to get to their work site on the trail. According to Ted Young, trail administrator from BCT, "opening the Banadad is always demanding due to the Forest Service's restriction on the use of power tools within the BWCA. However, this year it was particularly difficult as a result of several sever windstorms that wiped through the area in mid November. In the storms' wake the trail was littered with down trees. But as always, we got the job done. The Banadad is open and is now tracked. This year's Banadad trail work began in early fall. The first maintenance crew was a six person team from the U.S. Forest Service who canoed into Rush Lake where they set-up a base camp and from there they worked on a remote 1/2 mile section of the trail. Because of the remoteness of this section, it had been years since it was last cleared. According to Young, " I think all skiers planning to ski the Banadad this year should give a special thanks to the efforts of the North Stars, the Minnehaha Academy Ski Team, and the other volunteers for their help in getting the Banadad open and for the many other years they have volunteer their time on this trail." Young continued, "Without these volunteers I am not sure how we would ever be able to maintain this beautiful wilderness ski trail. Next year if you are planning to ski the trail; how about lending a hand and pitching in on the maintenance." The snow started on December 14 and it continued and continued, two days late there was twelve inches at Little Ollie Lake. Closer to Grand Marais from on top of Maple Hill to the Greenwood Road close to two feet of snow fell. This area is traditionally the Gunflint snow-belt. Further up the Gunflint near the end of the trail somewhere around six inches came down. Currently at Poplar Creek Guesthouse B&B there is 19" to 20" inches of snow on the ground. According to Lee Kerfoot at Gunflint Lodge, Gunflint Lake finally froze over sometime between December 11th and 12th. No word yet about Sag, one of the last lakes to freeze. Meanwhile the smaller lake include Poplar are now safe for winter trail. Boundary Country Trekking announce that there now is enough snow on the ground, 8-10 inches, around Ollie Lake for snowshoeing. 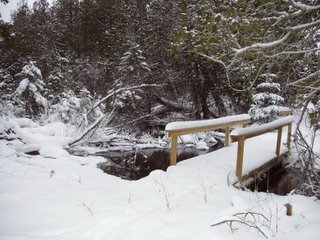 The snowshoe trails are open! Snowshoers this year can travel on six and one half miles of trails in and around the Poplar Creek Guesthouse B&B and the Little Ollie Cabin. The picture is of the snowshoe bridge across the Poplar Creek. According to Barbara Young co-owner of Boundary Country Trekking, "this year we added over a mile of new snowshoe trails. You can snowshoe the entire glacial esker ridgeline from the Little Ollie Cabin to Poplar Creek on a new short trail section completed this summer. It is a beautiful view from this ridgeline. Also new this year is a snowshoe trail connecting the Banadad with the Tall Pines Yurt. We already have enough snow to snowshoe. So plan to join us this winter and try your hand at this quiet sport." Meanwhile, Boundary Country Trekking's staff are clearing the last few miles of the Banadad Ski Trail. They expect to complete their work by December 15 and officially open the entire Banadad for skiing. While not yet tracked the first six mile in from the eastern trailhead is clear and rated as good skiing. The winter’s snow has been blanketing Chik-Wauk Lodge in the long-shadowed Superior National Forest. If your thoughts drift to The Gunflint Trail Historical Society’s dream of establishing a historical museum there, you might be wondering if we have made any progress. You probably are all aware that in July we had our very first meeting, in September we incorporated, and in October the committee reports were due for our Business Plan. In November the letters of support arrived and the details of the Business Plan were finalized and mailed to the US Forest Service. Our application to the IRS for the 501(c)(3) tax-exempt status was also mailed in November. We had many reasons to celebrate Thanksgiving. Another reason to give thanks was that all of you supported The GTHS with your memberships and donations. Without your continued support, the historical museum will remain only a dream and never become a reality. You might also like to know that our Grant Writing Committee is busy researching possible areas of support. They have a formidable task and any suggestions would be welcome (contact person: Bruce Kerfoot: bk@boreal.org). Now it’s time to wish you peace of the season and the hope that the US Forest Service will give us the present we are waiting for…a positive answer to our proposal to partner with them on creating a historical museum in the Chik-Wauk Lodge building. The Gunflint Trail Association (GTA) has voted to eliminate the job of Executive Director and created a new position of Gunflint Travel and Information Center (GTIC) booth Manager. According to Shari Baker, GTA president stated the purpose of the move is to trim salary expense. Ms Baker went on to state that, "we will be streamlining the staffing of the GTIC along with some of the administrative needs. We will be creating the new position of GTIC manager to operate full time out of the GTIC booth. "